12.5" RCOS @ ~f/9 (2880 mm fl) 0.64 arcsec / pixel. Zoomify image scale is 0.64 to 3.08 arcsec / pixel. eXcalibrator for (u-g), (g-r) color calibration, using 5 stars from the SDSS7 database. North is ~ to top. The image is rotated 10° clockwise. 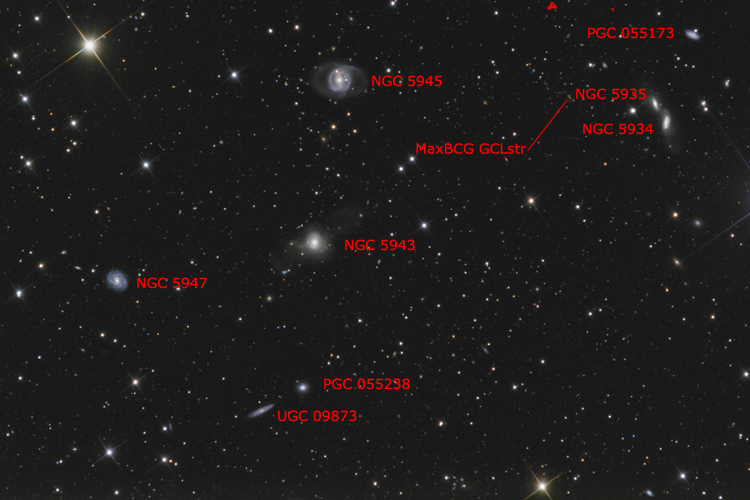 NGC 5945, along with the other galaxies in the image, are located in the constellation Boötes. NGC 5945 is a beautiful example of a barred galaxy, with two nearly circular spiral arms. The two arms appear to have a high concentration of hot young blue stars. Just above the rings is a blue area, of possibly similar stars, that appear to have become slightly disconnected from the galaxy. This area probably created the oval ring that surrounds the galaxy. To the far right, of NGC 5945, is a wonderful pair of interacting galaxies... NGC 5934 and 5935. At the center of the image is the NGC 5943. Closer examination reveals a jet coming from the left side of the galaxy. This jet may be related to the large, and faint, cloud that extends to the upper right and lower left of NGC 5943. Unfortunately, searching the Internet revealed little information about these galaxies. The above is all speculation by the author... an amateur astronomer.